We all need a little help in the kitchen sometimes and anything that handles more jobs with less washing up is always a good win. The Bamix Swissline Hand Blender does it all. Versatile, powerful and efficient, this incredible multifunctional tool powers through every task it’s given. Need to blend, chop, puree, or stir? You name it, the Bamix does it all. This sleek kitchen accessory is like a stick blender and food processor rolled into one. This precision swiss-engineered kitchen assistant makes light work of mincing, stirring, beating, frothing and emulsifying. It even crushes ice. And just like the original Bamix, it can turn cold skimmed milk to the consistency of double cream in just moments. Brilliantly simple and easy to use, this compact ‘magic wand’ has been adopted by chefs and cooks all around the world. You won’t need to look further than the Bamix Swissline Hand Blender to conquer your kitchen tasks. 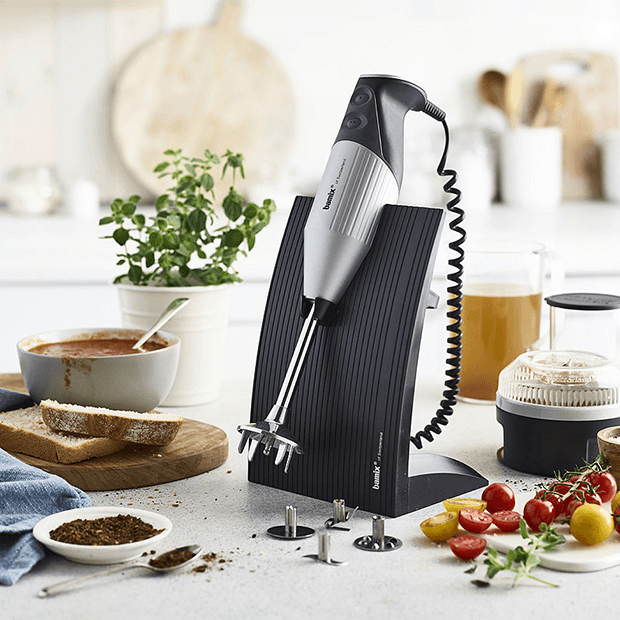 The Bamix Swissline includes interchangeable multipurpose, whisk and beater blades, a 1 litre jug, a dry processor attachment (which turns your Bamix into a mini food processor) and a storage stand. Plus it comes with an EXCLUSIVE bundle of FREE accessories worth over £45 including a meat mincer blade, powder disc, 400ml and 600ml beakers with lids.